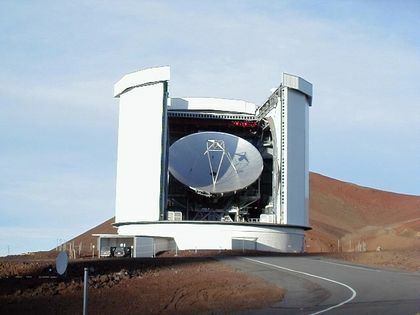 The James-Clerk-Maxwell Observatory was inaugurated in 1987 near the summit of Mauna Kea volcano in Hawaii. It was the result of an initiative by the United Kingdom’s Science Research Council to construct a radio telescope capable of studying celestial objects that emit very little light. Such objects are invisible to conventional optical telescopes. The observatory is named after James Clerk Maxwell, a Scottish physicist who was famous for his groundbreaking work in electricity and magnetism. The construction of the observatory from 1983 to 1987 was completed by the United Kingdom and the Netherlands. At the time of the observatory’s construction, the National Research Council of Canada was planning to resurface its 46-metre radio telescope at the Algonquin Radio Astronomy Observatory. The goal of the resurfacing program was to increase the resolution of the telecope so that it could observe wavelengths as small as three millimetres. Upon learning of the capabilities of the new British-Dutch radio telescope, the Council decided instead to close the Algonquin Observatory in 1987and to purchase a 25% share in the James-Clerk-Maxwell Telescope. The JCMT would suit the needs of Canadian astronomers because it was to operate at wavelengths in the submillimetre to lower microwave range (between 0.3 to 2 millimetres). The James-Clerk-Maxwell radio telescope consists of an aluminum parabolic antenna measuring 15 metres in diameter. It is supported by a heavy structure designed to minimize distortions in the dish, and the entire assembly weighs 70 tonnes. Canada currently has access to 22.5% of observation time, the United Kingdom 49.5%, the Netherlands 18%, and the international community 10%. 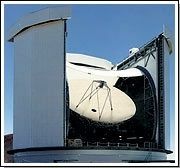 A piece of Gore-TexTM (the largest in the world) is permanently attached to the building’s opening, which protects the telescope from wind and dust but still allows it to “see” the sky. Gore-Tex allows 97% of submillimetre waves to pass through and does not interfere with the operation of the radio telescope. The number one enemy of a radio telescope is water vapour in the Earth’s atmosphere because it easily absorbs submillimetre waves. To minimize this effect, the observatory is located at an elevation of 4,092 metres: 97% of atmospheric water vapour exists below this elevation and thus below the observatory. The main use of radio telescopes is to study our solar system (the Sun, planets and comets), interstellar matter, distant galaxies, quasars, and cosmic background radiation. The government organization responsible for Canadian participation in the radio telescope is the National Research Council of Canada’s Herzberg Institute of Astrophysics.